For the 2015 war-drama film, see Klezmer (film). Klezmer (Yiddish: כליזמר or קלעזמער (klezmer), pl. : כליזמרים (klezmorim) – instruments of music) is a musical tradition of the Ashkenazi Jews of Eastern Europe. Played by professional musicians called klezmorim in ensembles known as kapelye, the genre originally consisted largely of dance tunes and instrumental display pieces for weddings and other celebrations. In the United States the genre evolved considerably as Yiddish-speaking Jewish immigrants from Eastern Europe, who arrived between 1880 and 1924, came into contact with American jazz. During the initial years after the klezmer revival of the 1970s, the American sub-variety was what most people knew as klezmer, although in the 21st century musicians began paying more attention to the original pre-jazz traditions as revivalists including Josh Horowitz, Yale Strom and Bob Cohen have spent years doing field research in Eastern/Central Europe. Additionally, later immigrants from the Soviet Union, such as German Goldenshtayn, took their surviving repertoires to the United States and Israel in the 1980s. Compared with most other European folk-music styles, little is known about the history of klezmer music, and much of what is said about it remains uncertain. There is however, a heavy influence of Romani music, which makes sense since many Jews and Roma lived side by side in Europe. The term klezmer comes from a combination of Hebrew words: kli, meaning "tool, or utensil" and zemer, meaning "to make music"; leading to k'li zemer כְּלִי זֶמֶר, literally "vessels of song" = "musical instrument". Originally, klezmer referred to musical instruments, and was later extended to refer, as a pejorative, to musicians themselves. From the 16th to 18th centuries, it replaced older terms such as leyts (clown). It was not until the late 20th century that the word came to identify a musical genre. Early 20th century recordings and writings most often refer to the style as "Yiddish" music, although it is also sometimes called Freilech music (Yiddish, literally "Happy music"). The first recordings to use the term "klezmer" to refer to the music were The Klezmorim's East Side Wedding and Streets of Gold in 1977/78, followed by Andy Statman and Zev Feldman's Jewish Klezmer Music in 1979. Klezmer is easily identifiable by its characteristic expressive melodies, reminiscent of the human voice, complete with laughing and weeping. This is not a coincidence; the style is meant to imitate khazone and paraliturgical singing. A number of dreydlekh (a Yiddish word for musical ornaments), such as krekhts ("sobs") are used to produce this style. The Bible has several descriptions of orchestras and Levites making music, but after the destruction of the Second Temple in 70 CE, many Rabbis discouraged musical instruments. However, the importance of merrymaking at weddings was not diminished, and musicians came forth to fill that niche, klezmorim. The first klezmer known by name was Yakobius ben Yakobius, a player of the aulos in Samaria in the 2nd century CE. The earliest written record of the klezmorim is in the 15th century. It is unlikely that they played music recognizable as klezmer today since the style and structure of klezmer as we know it today is thought to have come largely from 19th century Bessarabia, where the bulk of today's traditional repertoire was written. Klezmorim based much of their secular instrumental music upon the devotional vocal music of the synagogue, in particular cantorial music. Even so, klezmorim—along with other entertainers—were typically looked down on by Rabbis because of their secular traveling lifestyle. Klezmorim often travelled and played with Romani musicians ("lăutari"), because they occupied similar social strata. They had a great influence on each other musically and linguistically (the extensive klezmer argot in Yiddish includes some Romani borrowings). Klezmorim were respected for their musical abilities and diverse repertoire, but they were by no means restricted to playing klezmer. They sometimes played for Christian churches and local aristocracy, and taught some Italian classical violin virtuosos. 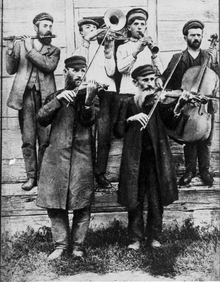 Like other professional musicians, klezmorim were often limited by authorities. In Ukraine they were banned from playing loud instruments, until the 19th century. Hence musicians took up the violin, tsimbl (or cymbalom), and other stringed instruments. The first musician to play klezmer in European concerts, Josef Gusikov, played a type of xylophone which he invented and called a "wood and straw instrument". It was laid out like a cymbalom, and attracted comments from Felix Mendelssohn (highly favourable) and Liszt (condemnatory). Later, around 1855 under the reign of Alexander II of Russia, Ukraine permitted loud instruments. The clarinet started to replace the violin as the instrument of choice. Also, a shift towards brass and percussion happened when klezmorim were conscripted into military bands. As Jews left Eastern Europe and the shtetls (see a related article about the artist Chaim Goldberg, who depicted klezmer performers of the shtetl in his paintings), klezmer spread throughout the globe, to the United States as well as to Canada, Mexico, and Argentina. Initially, the klezmer tradition was not maintained much by U.S. Jews. In the 1920s, clarinetists Dave Tarras and Naftule Brandwein caused a brief, influential revival, but Hankus Netsky has noted that "few of the performers of this era actually referred to themselves as klezmorim, and the term is found nowhere in any Jewish instrumental recording of the time." (The soprano Isa Kremer was a popular exponent of Yiddish song internationally during the first half of the 20th century; notably making several recordings with Columbia Records and appearing often at Carnegie Hall and other major venues in the U.S. from 1922-1950.) As U.S. Jews began to adopt mainstream culture, the popularity of klezmer waned, and Jewish celebrations were increasingly accompanied by non-Jewish music. While traditional performances may have been on the decline, many Jewish composers who had mainstream success, such as Leonard Bernstein and Aaron Copland, continued to be influenced by the klezmeric idioms heard during their youth (as Gustav Mahler had been). George Gershwin was familiar with klezmer music, and the opening clarinet glissando of Rhapsody in Blue suggests this influence, although the composer did not compose klezmer directly. Some clarinet stylings of swing jazz bandleaders Benny Goodman and Artie Shaw can be interpreted as having been derived from klezmer, as can the "freilach swing" playing of other Jewish artists of the period such as trumpeter Ziggy Elman. At the same time, non-Jewish composers were also turning to klezmer for a prolific source of fascinating thematic material. Dmitri Shostakovich in particular admired klezmer music for embracing both the ecstasy and the despair of human life, and quoted several melodies in his chamber masterpieces, the Piano Quintet in G minor, op. 57 (1940), the Piano Trio No. 2 in E minor, op. 67 (1944), and the String Quartet No. 8 in C minor, op. 110 (1960). In the mid-to-late 1970s there was a klezmer revival in the United States and Europe, led by Giora Feidman, The Klezmorim, Zev Feldman, Andy Statman, and the Klezmer Conservatory Band. They drew their repertoire from recordings and surviving musicians of U.S. klezmer. In 1985, Henry Sapoznik and Adrienne Cooper founded KlezKamp to teach klezmer and other Yiddish music. The 1980s saw a second wave of revival, as interest grew in more traditionally inspired performances with string instruments, largely with non-Jews of the United States and Germany. Musicians began to track down older European klezmer, by listening to recordings, finding transcriptions, and making field recordings of the few klezmorim left in Eastern Europe. Key performers in this style are Joel Rubin, Budowitz, Khevrisa, Di Naye Kapelye, Yale Strom, The Chicago Klezmer Ensemble, The Maxwell Street Klezmer Band, the violinists Alicia Svigals, Steven Greenman, Cookie Segelstein and Elie Rosenblatt, flutist Adrianne Greenbaum, and tsimbl player Pete Rushefsky. Other artists like Yale Strom used their first-hand field research and recordings from as early as 1981 in Central and Eastern Europe as a foundation for more of a fusion between traditional repertoire and original compositions, as well as incorporating the Rom (Roma) music element into the Jewish style. Bands like Brave Old World, Hot Pstromi and The Klezmatics also emerged during this period. In the 1990s, musicians from the San Francisco Bay Area helped further interest in klezmer music by taking it into new territory. Clarinetist Ben Goldberg and drummer Kenny Wollesen, after playing in Bay Area-based The Klezmorim, formed the critically acclaimed New Klezmer Trio—kicking open the door for radical experiments with Ashkenazi music and paving the way for John Zorn's Masada, Naftule's Dream, Don Byron's Mickey Katz project and violinist Daniel Hoffman's band Davka. The New Orleans Klezmer All-Stars  also formed in 1991 with a mixture of New Orleans funk, jazz, and klezmer styles. Interest in klezmer has been sustained and supported by such well-known avant-garde jazz musicians as John Zorn and Don Byron, who sometimes blend klezmer with jazz. Klezmer melodies have recently been incorporated into songs by third-wave Ska band Streetlight Manifesto. Singer/songwriter Tomas Kalnoky frequently slips in horn licks with Russian and Jewish origins. Mames Babegenush was formed in Copenhagen, Denmark, in 2004 out of strong Scandinavian roots merged with traditional klezmer, influenced on the klezmer side by masters like Naftule Brandwein, Abe Schwartz and Dave Tarras. Today the band has developed a new sound of modern klezmer, pushing the perimeter of klezmer to incorporate many cultures and touring worldwide. The band's most recent album Mames Babegenush With Strings (2017) was warmly received with 5-6 stars reviews in such magazines as Songlines and fRoots. Starting in 2008, "The Other Europeans" project, funded by several EU cultural institutions, spent a year doing intensive field research in Moldavia under the leadership of Alan Bern and scholar Zev Feldman. They wanted to explore klezmer and lautari roots, and fuse the music of the two "other European" groups. The resulting band now performs internationally. As with this ensemble, groups like Di Naye Kapelye and Yale Strom & Hot Pstromi have incorporated Rom musicians and elements since their inceptions. A separate klezmer tradition had developed in Israel in the 20th century. Clarinetists Moshe Berlin and Avrum Leib Burstein are known exponents of the klezmer style in Israel. In order to preserve and promote klezmer music in Israel, Burstein founded the Jerusalem Klezmer Association, which has become a center for learning and performance of Klezmer music in the country. According to Walter Zev Feldman, the klezmer dance repertoire seems to have been relatively uniform across the areas of Jewish settlement in the Russian Empire. Much of the traditional klezmer repertoire was created by professional klezmer musicians in the style of their region or tradition, and much co-territorial music such as non-Jewish folksongs, especially Romanian music (mainly from Moldavia), as well as Ukrainian music and Ottoman music, and the musics of other minorities living in the same areas as Jews in Southeastern Europe such as Crimean Tatars. Historically, young klezmorim learned tunes from their family and their elders in bands. However, there were several times in history where this transmission broke down, including mass emigration, but especially the Holocaust, which destroyed most of Jewish life and culture in Europe. Few scions of klezmer dynasties remained in Europe, one notable exception being Leopold Kozlowski of Poland. Undoubtedly, much has been lost of the repertoires played in various locations and social contexts—especially wedding repertoire, since although Jewish weddings could last several days, early recording technology could only capture a few minutes at a time. Also, recordings specific to one area may not have represented klezmer repertoire from other parts of the region. A few older klezmorim—such as Leon Schwartz, Dave Tarras, and German Goldenshtayn—survived into the klezmer revival era and could recall some forgotten repertoire. Also, some transcriptions survive from the 19th century. Some ethnomusicological work from Jewish Eastern Europe is still available in print, notably the work of Soviet Jewish field researcher Moshe Beregovski. In the 21st century, klezmer is typically learned from "fake books" and transcriptions of old recordings, although the music was traditionally transmitted and learned by ear. 8) circle dance, usually in the Ahava Rabboh melodic mode. Typically piano, accordion, or bass plays a duple oompah beat. These are by far the most popular klezmer dances. The name "Bulgar" (Yiddish "bulgarish") comes from the Romanian traditional song and dance (Romanian bulgarească). "Freylekh" is the Yiddish word for "festive." 4. It is one of the most common klezmer dances. Its name comes from the straight-legged, quick movements of the legs, reminiscent of the shears (Yiddish: sher) of tailors. 4. The dance steps can be performed in a circle or in a line. 4 time, which originated in Ukraine, and is prominent in the folk music of that country. 4 dance like the habanera. Terk in America is one famous arrangement by Naftule Brandwein, who used this form extensively. As its name indicates, it recalls Turkish styles. Skotshne ("hopping") could be an instrumental display piece, but also a dance piece, like a more elaborate freylekhs. Waltzes were very popular, whether classical, Russian, or Polish. A padespan was a sort of Russian/Spanish waltz known to klezmers. Mazurka and polka, Polish and Czech dances, respectively, were often played for both Jews and Gentiles. 4 (Romanian sârbă). It features hopping steps and short bursts of running, accompanied by triplets in the melody. Humoresque "Halaka" dance, a traditional Israeli dance from Safed in Galilee; it has an ancient melody handed down from generation to generation. Tango – well-known dance that originated in Argentina. These were extremely popular around the world in the 1930s, and many Eastern European tangos were originally written by Jews. Doina is an improvisational lament usually performed solo, and is extremely important in weddings. Its basis is the Romanian shepherd's lament, so it has an expressive vocal quality, like the singing of the khazn. Although it has no form, it is not just random sounds in a Jewish mode—the musician works with very particular references to Jewish prayer and East European laments. Often these references might occur in the form of harmonic movements or modal maneuvers that quote or otherwise invoke traditional Jewish cantorial practices. Typically it is performed on violin, cymbalom or clarinet, though it has been done on banjo, xylophone, flute, cornet, saxophone, tuba, and many other instruments. Often the doina is the first of a three-part set, followed by a hora, then either a freylekhs or khusidl. One can even hear recordings of contemporary vocalists singing the doina, including Michael Alpert and Elizabeth Schwartz. Taksim is a freeform prelude that introduces the motifs of the following piece, which is usually a freylekhs; it was largely supplanted by the doina. Fantazi or fantasy is a freeform song, traditionally played at Jewish weddings to the guests as they dined. It resembles the fantasia of "light" classical music. Most klezmer tunes are in several sections, sometimes with each in a different key. Many songs have alternating sections with major and minor keys. Klezmer music often uses "folk scales," or scales commonly found in folk music, such as the harmonic minor and phrygian dominant. Instrumental tunes often follow the types of chord progressions found in Middle Eastern and Greek music, whereas vocal Yiddish songs are often much simpler, and follow a style and chord progressions similar to Russian folk songs. Freylekhs are often in the form ABCB, which is rare in music. Having a third distinct section is a relatively unique aspect of klezmer music. A common ending for songs is an upwards chromatic run or glissando, followed by a slow staccato 8-5-1. They may also end with a Coda, a new melodic line that is accompanied by a change in the percussion rhythm and an increase in tempo. Klezmer is generally instrumental, although at weddings klezmorim traditionally accompanied the vocal stylings of the badkhn (wedding entertainer). A typical 19th-century European orchestra included a first violin, a contra-violin (or modified 3-stringed viola also called Groyse Fidl [Yid. Big Fiddle], Sekund, Kontra or Zsidó Bratsch [Hun. ]), a tsimbl (cimbalom or hammered dulcimer), a bass or cello, and sometimes a flute. Other instruments such as a piano or an accordion are used too. The melody is generally assigned to the lead violin, while the other instrumentalists provide harmony, rhythm, and some counterpoint (the latter usually coming from the second violin or viola). The inclusion of Jews in tsarist army bands during the 19th century led to the introduction of typical military band instruments into klezmer. The clarinet now often played the melody. Brass instruments—such as the French valved cornet and keyed German trumpet—eventually inherited a counter-voice role. Modern klezmer instrumentation is more commonly influenced by the instruments of the 19th century military bands than the earlier orchestras. The orchestration used by Joel Rubin—one of the most experienced and knowledgeable contemporary klezmer musicians—represents a historically justified link with that of contemporary ethnic music ensembles of Romania and Hungary. Percussion in early 20th-century klezmer recordings was generally minimal—no more than a wood block or snare drum. The snare drum is the more "authentic" of the two. Wood blocks were introduced by modern klezmorim to imitate recordings from the early 20th century that replaced snare drums—which tended to overwhelm the recording equipment of the time—with quieter instruments. In Eastern Europe, percussion was often provided by a drummer who played a frame drum, or poyk, sometimes called baraban. A poyk is similar to a bass drum and often has a cymbal or piece of metal mounted on top, which is struck by a beater or a small cymbal strapped to the hand. In Bulgaria, Serbia, and Macedonia, sometimes the paykler (drummer) also played in the tapan style, i.e., with a switch in one hand on a thin tight head, and a mallet in the other, on a thicker, looser head. Some klezmer revival bands look to loud-instrument klezmer, jazz, and Dixieland for inspiration. Their bands are similar to a typical jazz band, with some differences. They use a clarinet, saxophone, or trumpet for the melody, and make great use of the trombone for slides and other flourishes. When a cymbalom sound is called for, a piano may be played. There is usually a brass instrument ensemble, and sometimes a tuba substitutes for bass. Performers in this style include The Klezmorim, The Klezmatics, The Klezmer Conservatory Band, and The Maxwell Street Klezmer Band. Other bands look back to different eras or regions in an effort to recreate specific styles of klezmer—for example, Budowitz, the Chicago Klezmer Band, Veretski Pass, Di Naye Kapelye, and the Hungarian band Muzsikas with its album Maramoros: the Lost Jewish Music of Transylvania. Klezmer instrument choices were traditionally based, by necessity, on an instrument's portability. Music being required for several parts of the wedding ceremony, taking place in different rooms or courtyards, the band had to relocate quickly from space to space. Further, klezmorim were usually itinerant musicians, who moved from town to town for work. Therefore, instruments held in the hands (clarinet, violin, trumpet, flute) or supported by a neck or shoulder strap (accordion, cimbalom, drum) were favored over those that rested on the ground (cello, bass violin), or needed several people to move (piano). In America, this trend has continued into the present day, with hand-held or strap-held instruments like guitars, saxophones, and even harmonicas integrated into klezmer ensembles. For example, the typical American klezmer wedding band uses a portable electronic synthesizer, not a piano. The compositions of Israeli-born composer Ofer Ben-Amots incorporate aspects of klezmer music, most notably his 2006 composition Klezmer Concerto. The piece is for klezmer clarinet (written for Jewish clarinetist David Krakauer), string orchestra, harp and percussion. Like other musicians of their time, and many modern jazz performers, early klezmorim did not rigidly follow the beat. Often they slightly led or trailed it, giving a lilting sound. Klezmer is usually played in shteygerim, prayer modes of the synagogue. They are closely related to Greek, Turkish, and other "co-territorial" modes of Southeastern and Central Europe. The following are the names of these modes; the names are taken from the names of familiar prayers that use that mode (imagine an American composer referring to a piece as "a Grand Old Flag" instead of as "a march"). Ahavo Rabboh means "Abounding Love" in Hebrew, and refers to a prayer from the daily morning prayer service (shacharis). It is built on the 5th degree of the harmonic minor scale, with a descending tetrachord to the tonic being the most characteristic final cadence. It is also called the "Freygish", a Yiddish term derived from the German "Phrygisch", or Phrygian mode (specifically, the Phrygian dominant scale). It is considered the mode of supplication. Conversely, it can be thought of as a natural minor scale with lowered 2nd, and augmented 3rd degrees. It is similar to the Arabic Hijaz maqam. Much of klezmer music uses the Ahavah Rabboh scale (such as Nigun Rikud, Tish Nigun and numerous freylekhs), although Mi Sheberach is prevalent as well. Mi Shebeirach means "He who blessed" in Hebrew, from the Mi Shebeirach prayer, recited after the honor of being called to the Torah reading. It is also called the Ukrainian, Altered Ukrainian, Doina, or Altered Dorian. It is similar to the natural minor scale, but has raised fourth and sixth scale degrees, and is used often for the doina or dance pieces, like the Odessa Bulgar. When used in combination with the Ahavoh Rabboh scale in the same piece (as in Mayn Shtetl Yas), the Mi Shebeirach section is usually a whole tone below the Ahavoh Rabboh scale (for example, D Ahavoh Rabboh changes to C Mi Shebeirach or vice versa). Adoyn-y Moloch means "my Lord reigns" in Hebrew. It is common in traditional synagogue services (they are the beginning words of many of the Psalms). It is similar to the Western Mixolydian mode and can be thought of as a major scale with a lowered 7th, which is sometimes raised at cadences, but is generally avoided altogether. Mogen Ovoys means "our forebears' shield" in Hebrew. It is an older mode from the synagogue, derived from the Friday night prayers. It is similar to the Western melodic minor scale. Yishtabach means "it shall become superb" in Hebrew (from the daily morning services). It has a frequent lowering of the 2nd and 5th. It is related to Mogein Ovoys, above. ^ Mark Slobin, Fiddler on the Move. p.93. ^ "About the Klezmer Revival". klezmershack.com. Retrieved 19 January 2016. ^ "YIVO | Music: Traditional and Instrumental Music". Yivoencyclopedia.org. Retrieved 2016-01-19. ^ Lois Barr. "Isa Kremer". Jewish Women's Archive. ^ Rogovoy, S. (2000). The Essential Klezmer. Algonquin Books. p. 71. ISBN 978-1-56512-863-7. Retrieved May 1, 2017. ^ "Steven Greenman". stevengreenman.com. Retrieved 19 January 2016. ^ Bailey, C. Michael (2018-01-30). "Review of fourth self-entitled album, Mames Mames Babegenush (2014)". www.allaboutjazz. ^ "Mames Babegenush With Strings". 20 October 2017. ^ "The Other Europeans". other-europeans-band.eu. Archived from the original on 30 April 2011. Retrieved 19 January 2016. ^ "The Jerusalem Klezmer Association". ^ "Budowitz Homepage". Budowitz.com. Retrieved 2016-01-19. ^ "KLEZMER MUSIC". users.ch. Retrieved 19 January 2016. ^ "Ofer Ben-Amots: The Klezmer Concerto". Bernstein Artists, Inc. 2006. Archived from the original on 6 June 2014. Retrieved 6 June 2014. ^ Ben-Amots, Ofer (2006). Klezmer Concerto. Colorado Springs: The Composer's Own Press. ISBN 978-1-939382-07-8. ^ "The Main Klezmer Modes". klezmershack.com. 24 July 1999. Retrieved 19 January 2016. ^ Rubin, Joel; Ottens, Rita (15 May 2000). "A Tickle in the Heart". Archived from the original on 2009-04-04.